Product prices and availability are accurate as of 2019-03-09 09:22:37 EST and are subject to change. Any price and availability information displayed on http://www.amazon.com/ at the time of purchase will apply to the purchase of this product. Abies koreana 'Silvershow' (Silvershow Fir) * Full sun - partial shade * Zones 5-8 * 8' tall * 4' wide * Leaves on all branches curl upward and back towards the stem. The underside of the leaves are silver! Stunnning purple Cones in Spring! Silvershow Fir is a special variety of Korean Fir. A small, slow-growing. evergreen coniferous tree with a bushy habit. 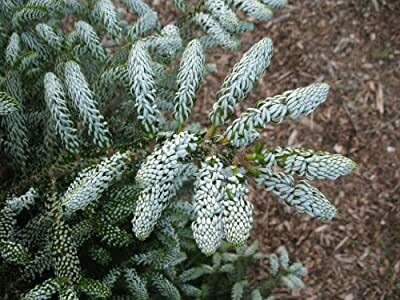 The needles are twisted upwards so that they catch the light, revealing silver undersides, giving the impression of an exuberantly flocked Noble Fir. Ever eye-catching, it possesses magnificent, violet-purple cones, which gradually change to brown. This is a fabulous specimen, which is best when grown in a sunny position, where it will catch the light. It will grow into a perfect christmas tree shape with no pruning.